Goldman Sachs today announced the promotion of 69 employees to partner, traditionally considered one of the most prestigious roles on Wall Street. Unlike prior years when the title had been somewhat diluted when the bank was handing out the rank like hot candy, this year Goldman was far more selective in who it elevated to the top company rank. The promotions, which take place every two years, were down from the 84 appointed in 2016, and were the lowest since the bank went public in 1999. Within the details of new promotions provided by the bank, one stood out: of the newly promoted partners a whopping 29% were Millennials. As the WSJ previously reported, Goldman's new CEO David Solomon had been pushing to shrink the size of partner classes, partly because Goldman has been hiring more partners from outside the bank. 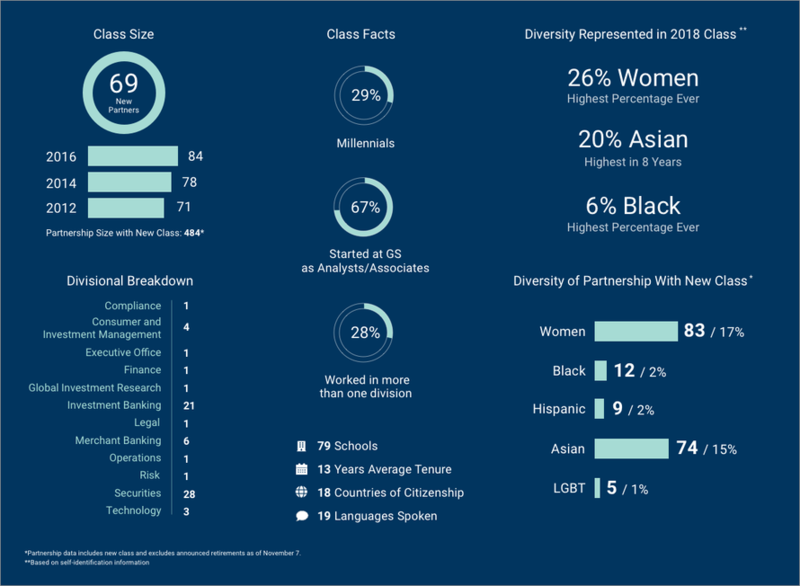 Furthermore, in what was arguably the most diverse class yet, of the new partners 26% are women, the highest proportion in the firm’s history. Last time, women accounted for 23% of the class. Today is an important day for our culture and our people as we welcome a new class to the partnership. This talented group of individuals – representing the best of Goldman Sachs – will join our current partners in guiding, advising and inspiring our people to action on behalf of our clients and our firm. Partners, known as participating managing directors, typically receive a $950,000 salary and the opportunity to invest in private funds without fees. Still, life doesn’t get easy after reaching the partner level, where turnover can be high. More than a third of the bank’s partners in 2014 have since left. Twenty-eight of the new partners work in the trading division and 21 in investment banking. Only 1 new partner is from the bank's risk division. And in its pursuit of diversity, some 29% of the promoted partners were Millennials as Goldman disclosed in this infographic.